Take your costume to the next level by adding the right touch of makeup. Perfect when you have time but no extra cash to take your homemade costume from cool to mind-blowing. Even if you’re not super artistic, you can pull off these costume makeup ideas using the tutorials below. 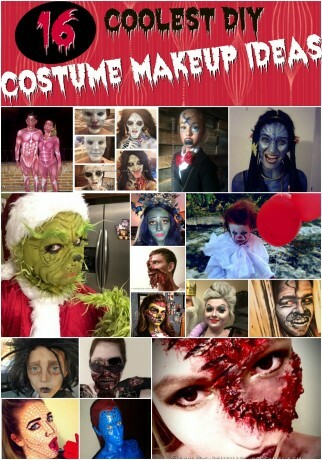 In addition, discover the best brands and techniques for creating a makeup costume. So, take a look at the range of ideas below for a memorable Halloween costume this year! A last-minute costume that costs under $10? Sign us up! Take a look at the simple steps Amanda took to create this cool pop art costume. 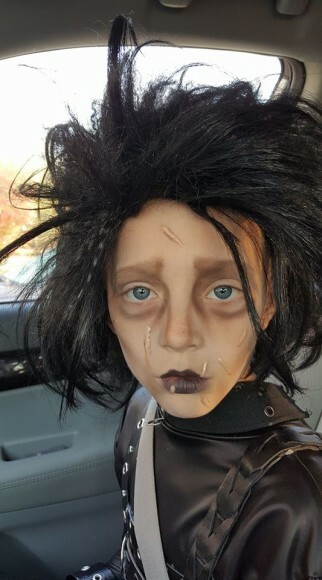 This hauntingly beautiful make-up job completely ties together this Edward Scissorhands costume. 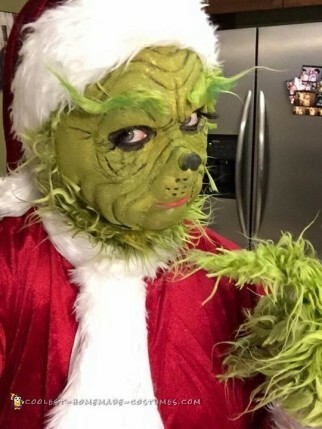 Watch Allison’s video here of her applying a latex mask and makeup to create the grinchiest Grinch of all time. 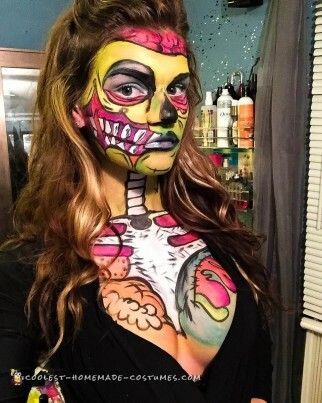 She will inspire you to whip out your makeup for your next DIY costume. 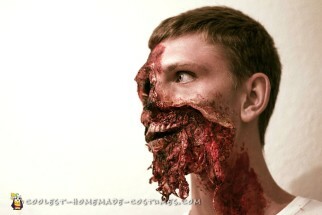 This frightening zombie makeup took 5 hours and many ounces of liquid latex. 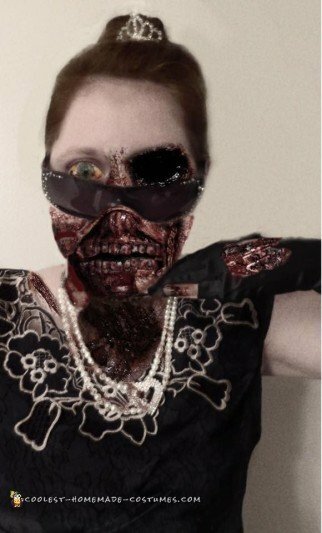 In the end, the completed makeup costume effect was totally worth it! 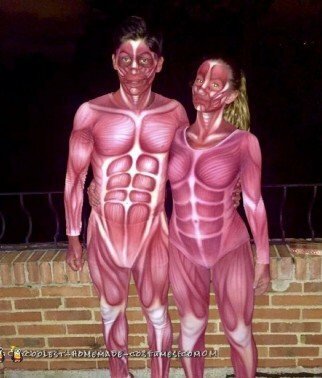 This mesmerizing couple costume looks more difficult to create than it really was. Using face paint and regular paint, you can seriously make this at home. 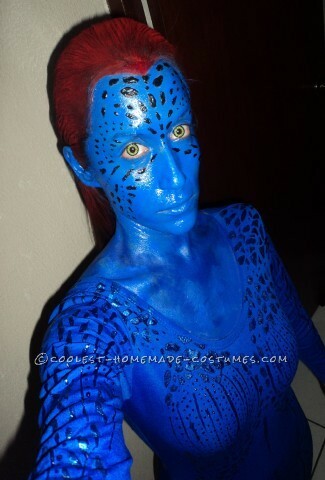 Just try and tear your eyes away from this incredible makeup costume! Just because you’re a corpse bride, doesn’t mean you can’t be beautiful. A simple mix of pale foundation cream, blue food coloring and white eye shadow gave this stunning homemade costume it’s finishing touch. 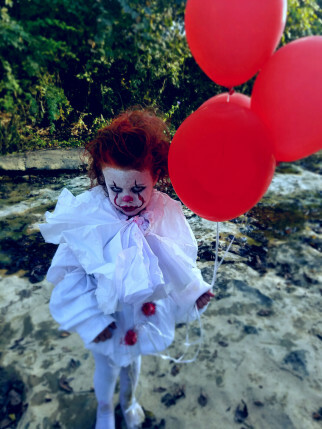 Transforming an adorable toddler into this scary Pennywise the Clown costume required makeup skills. And, of course, Heather had to get her daughter to actually sit still! 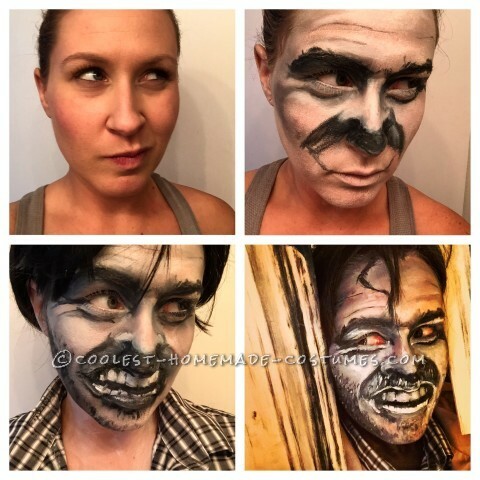 Using only black and white paint with grey eye shadows, this woman transformed her face into Jack Nicholson’s character from “The Shining”. Truly amazing. 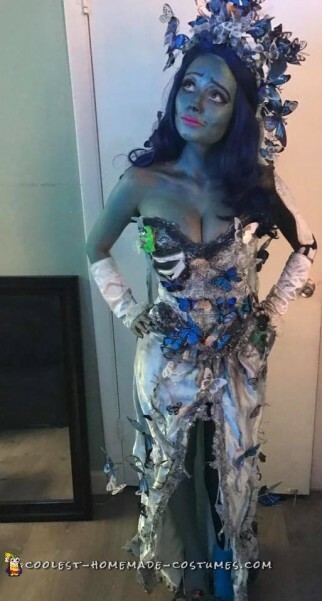 Paying attention to the little makeup details made Paola’s awesome homemade costume really pop. She actually won a trip to Cancun for two from a costume contest! Krista spent four hours creating her masterpiece and it was well worth it. Read all about it here and discover the paints she used to make her costume glow. 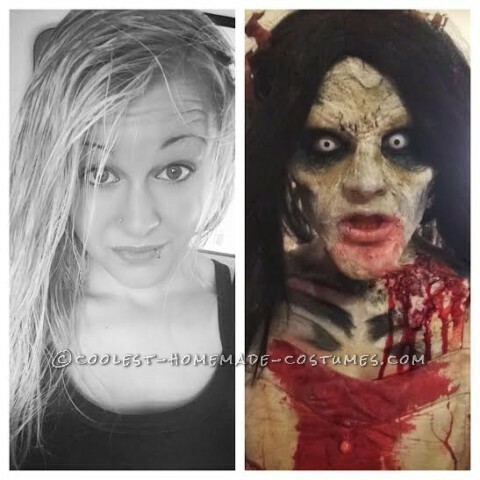 When a cosmetologist is inspired by “The Walking Dead”, makeup magic occurs. Needless to say, none of Alexandra’s friends recognized her and it took over an hour to get all that makeup off of her! 13. 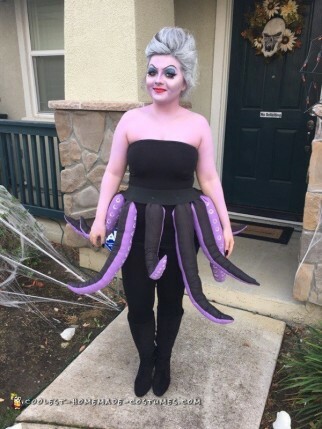 Homemade Ursula Costume, All Done in One Night! Using Mehron products for her makeup, Margie explains here how she transformed her features into Ursula’s villainous appearance. You don’t need complicated face makeup for a creepy Halloween costume. 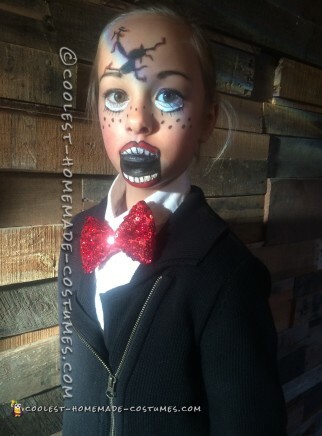 Check out the details on this sinister ventriloquist costume that took this girl’s mom less than 45 minutes to make. Denis was lucky to have a friend who wanted to practice her DIY costume makeup on his face. He had a great time scaring everyone with his exploded face makeup costume. But, he too, had major difficulties getting all the latex off his face. 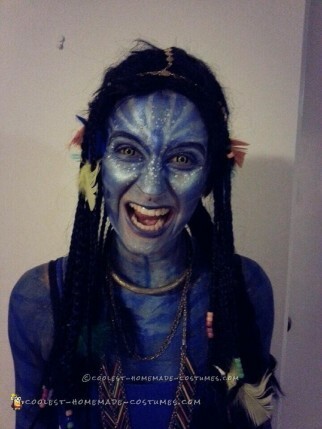 Using makeup, body paint and a simple costume, Sophie came up with this last minute Avatar costume that was a huge hit. 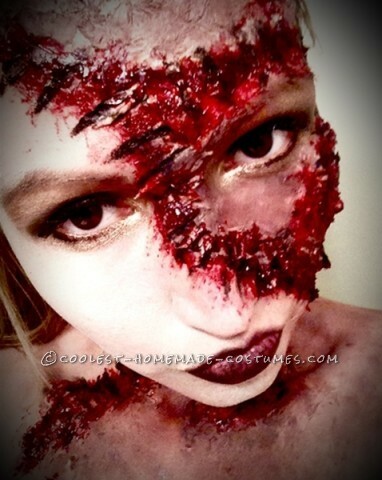 Check out our Editors’ Picks costumes for more costume makeup ideas!